Skip the queue with a mobile voucher when you book your Hong Kong Ocean Park tickets on Klook with the best price! Cross the Park via cable car and view the entire area from a bird's eye view! 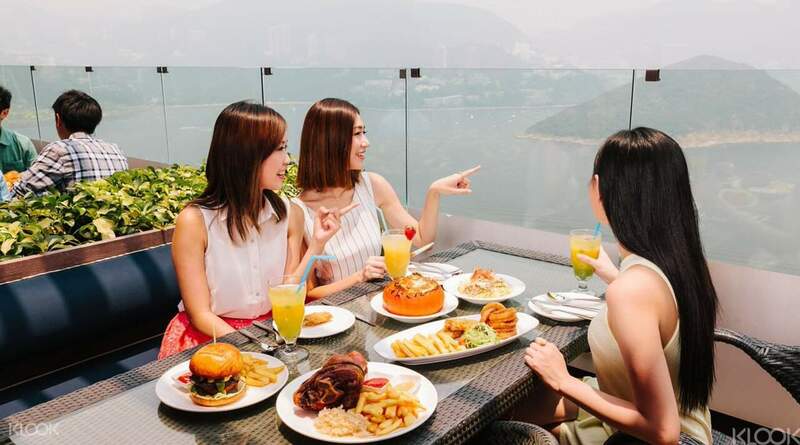 Enjoy a meal at a panda themed café or at Hong Kong's first aquarium dining experience! Avail of combo packages on Klook to get Ocean Park Tickets with a 4G SIM Card or Ocean Park and Airport Express Tickets at better prices! Check out Klook's Ocean Park Hong Kong guide to help you make the best of your day! A cross between the ultimate theme park and a zoo, Ocean Park in Hong Kong is a staple in every first-time visit to the city. 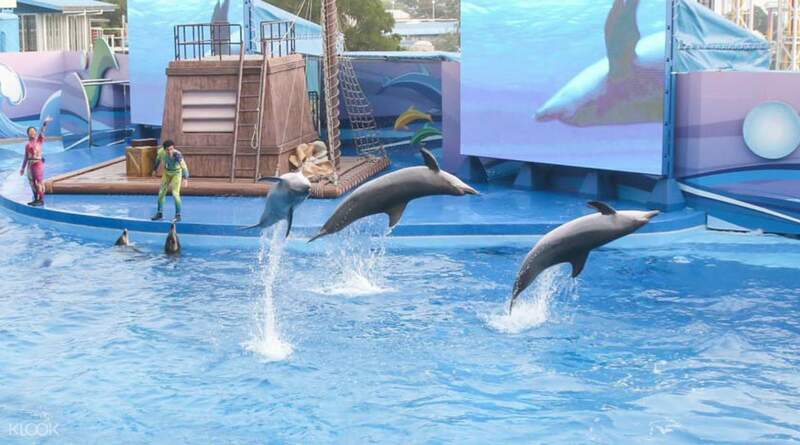 With Ocean Park Hong Kong tickets, you can get up close and personal with marine life in one of the largest aquariums in the world, Atoll Reef, and hop on the plethora of hair-raising rides - including one called the Hair-Raiser! - for a thrill-filled afternoon. 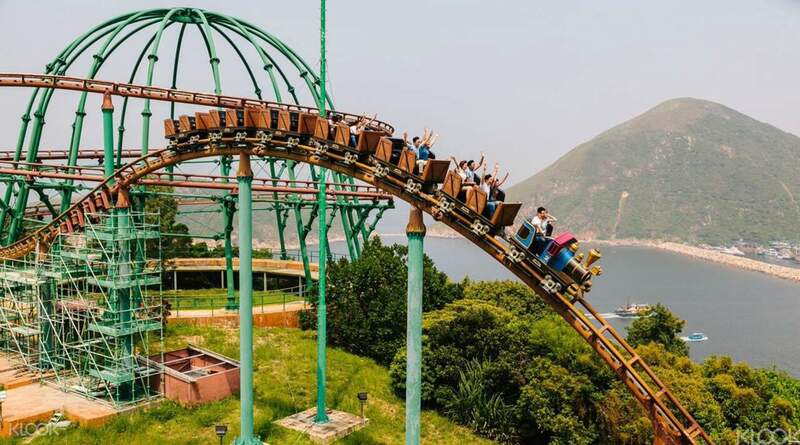 Well-loved among locals and tourists, Hong Kong Ocean Park is a destination worth marking a day or two on your itinerary for. 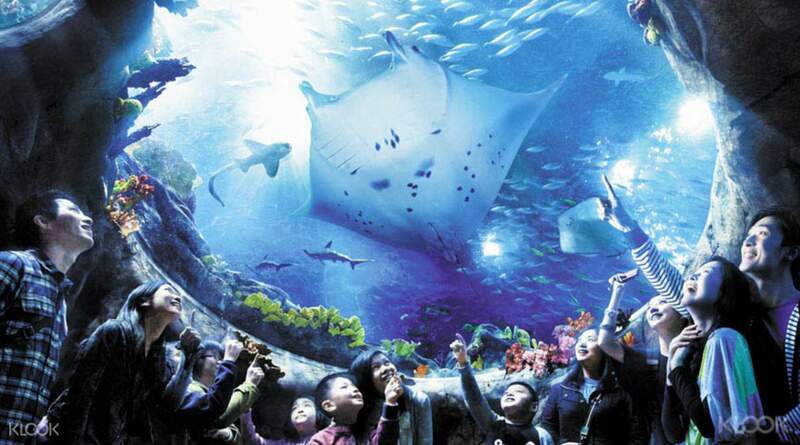 Get up close and personal with marine life in one of the world's largest aquariums at Hong Kong Ocean Park! See the amazing water tricks performed by dolphins and other sea life! I and my siblings aged 16, 20, and 22 love this theme park so much! Our favorite ride was the HAIR RAISER. It was our first time riding an extreme roller coaster yet we rode it three times in a row! We were also amazed by the various marine life in the Grand Aquarium. I'll definitely come visit again next time we're in Hongkong. I and my siblings aged 16, 20, and 22 love this theme park so much! Our favorite ride was the HAIR RAISER. It was our first time riding an extreme roller coaster yet we rode it three times in a row! We were also amazed by the various marine life in the Grand Aquarium. I'll definitely come visit again next time we're in Hongkong. It's so convenient, fast and easy to enter Ocean Park when you already booked with Klook! The price is also cheaper compared to paying directly to ocean park on the day of the visit.. We look forward to another adventure with Klook! It's so convenient, fast and easy to enter Ocean Park when you already booked with Klook! The price is also cheaper compared to paying directly to ocean park on the day of the visit.. We look forward to another adventure with Klook! best experience! simple and easy to just go through the gate with the QR code! we did the old Hong Kong tasting add on and it was well worth it! the vendors also accepted the QR code, no explanation necessary! thank you klook! best experience! simple and easy to just go through the gate with the QR code! we did the old Hong Kong tasting add on and it was well worth it! the vendors also accepted the QR code, no explanation necessary! thank you klook! The redemption process was very smooth. This package includes some snacks from the kiosk which is quite nice when you get tired walking around ocean's park. new edition to the park includes an ancient street of HK. Interesting. The redemption process was very smooth. This package includes some snacks from the kiosk which is quite nice when you get tired walking around ocean's park. new edition to the park includes an ancient street of HK. Interesting. I really enjoyed this theme park experience! It was quite near the city and it took us only 30 mins. From causeway bay to get there! Vouchers can be used as tickets! There were not much people when we went so we only waited for 5-15mins. On rides! Me and my friends had so much fun watching animal shows too! Definitely a must go when in hong kong!! I really enjoyed this theme park experience! It was quite near the city and it took us only 30 mins. From causeway bay to get there! Vouchers can be used as tickets! There were not much people when we went so we only waited for 5-15mins. On rides! Me and my friends had so much fun watching animal shows too! Definitely a must go when in hong kong!! Klook, the best! When we arrived at the Entrance, ticket counters we’re all block buster! Luckily we booked our tickets to Klook...we got to enter the premises easily! And the food voucher was so amazing. All in all, thumbs up Klook! Klook, the best! When we arrived at the Entrance, ticket counters we’re all block buster! Luckily we booked our tickets to Klook...we got to enter the premises easily! And the food voucher was so amazing. All in all, thumbs up Klook! Value for money. We booked Ocean Park admission tickets with Old Hong Kong Street food tasting and it was worth it. We enjoyed the attractions and rides. We did not spend extra money on food inside the park because the meal included in the package was enough (good selection too). My family had fried noodles, glutinous rice, egg puff, spicy fish balls, beef balls, sausages, and of course the milk tea. You can enter immediately by scanning the QR code and you can easily redeem the meal at the participating food kiosks in Old Hong Kong street. Value for money. We booked Ocean Park admission tickets with Old Hong Kong Street food tasting and it was worth it. We enjoyed the attractions and rides. We did not spend extra money on food inside the park because the meal included in the package was enough (good selection too). My family had fried noodles, glutinous rice, egg puff, spicy fish balls, beef balls, sausages, and of course the milk tea. You can enter immediately by scanning the QR code and you can easily redeem the meal at the participating food kiosks in Old Hong Kong street. The experience was great especially on the cable car going up. The free food tasting was great too, but we were not able to avail the drinks because we went down late afternoon. I wish the park time is extended for some more hours. The experience was great especially on the cable car going up. The free food tasting was great too, but we were not able to avail the drinks because we went down late afternoon. I wish the park time is extended for some more hours. At first I was hesitant since it was my first time to buy tickets from klook. I was thinking instead of saving money, I might end up spending more if they will not allow us to get in the park. But i was definitely wrong. It was so easy to use. They will just scan the QR code then done! I bought our tickets for half the price. Thank you so much! And i will definitely buy tickets from klook again. At first I was hesitant since it was my first time to buy tickets from klook. I was thinking instead of saving money, I might end up spending more if they will not allow us to get in the park. But i was definitely wrong. It was so easy to use. They will just scan the QR code then done! I bought our tickets for half the price. Thank you so much! And i will definitely buy tickets from klook again. A: No. You can use the Ocean Park tickets on any day before the expiration date indicated on the voucher. A: Yes. Ocean Park will accept e-tickets displayed on mobile devices for entry into the park. Q: Can I upgrade my Ocean Park ticket to an annual pass?